I’ve had a few revelations this past week. They were momentous. Firstly – vegan/dairy-free butter (the brand I bought was Earth Balance) is not much more expensive than normal butter. I probably spent only 50 cents more on Earth Balance than I would on normal butter. Which – UH, HELLO, butter is now back in my life. Or rather ‘butter’ is back in my life. I mean, what have I been doing this whole time without butter? Dying. That’s what I’ve been doing. DYING. The second thing that I’ve discovered is that Earth Balance is a perfect substitute for biscuits. I live in the South and love living here. The food culture is insane. Unfortunately, it’s not terribly friendly to those who have food sensitivities or alternative diets. There is a WHOLE lot of meat, lard, fats, dairy, and all things that I used to indulge in and eat ecstatically. I have no judgement for people who eat all of this. In fact, half the time – I am in awe and jealousy that you guys can eat all of this and not feel as terrible as I would. Anyways, back to biscuits. I thought I’d never have a decent biscuit again. But, nope. Here they are. Biscuits. However, these are NOT normal biscuits. It is now the first week of October and there is a slight, crisp edge to the air and I’ve been feeling like wallowing shamelessly in the new fall season. So. 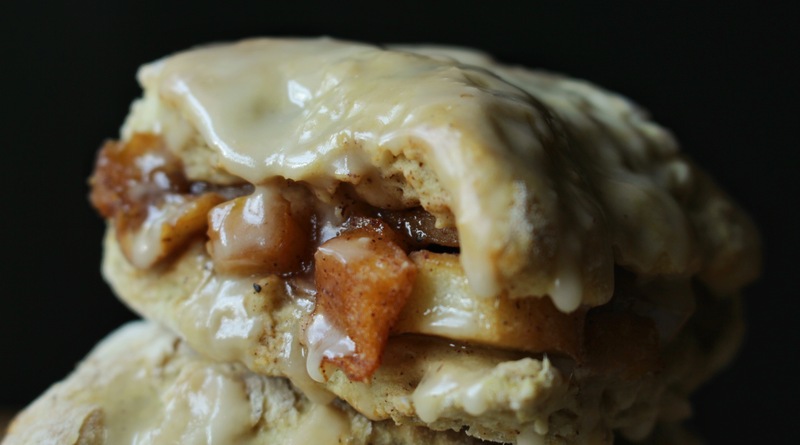 I filled some biscuits with cinnamon and apples and slathered them with maple syrup and bourbon. Yes. 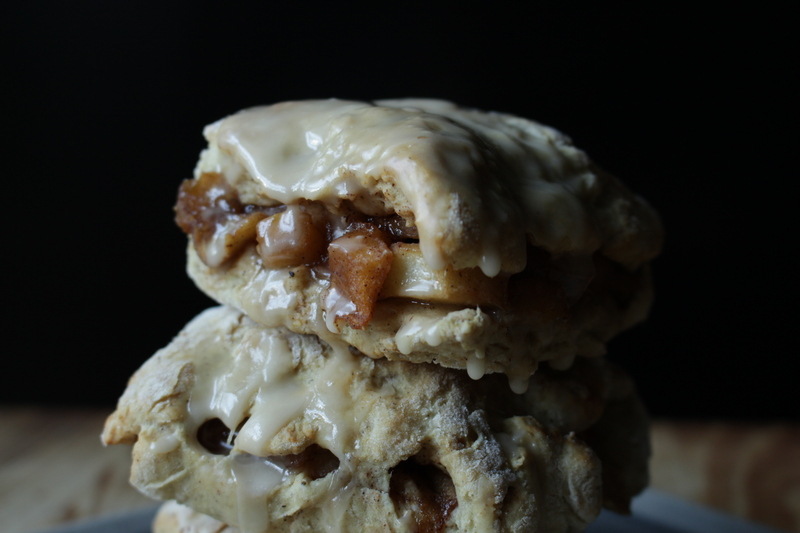 I filled biscuits with beautiful, homemade, apple pie filling and drenched the biscuits in a maple syrup and bourbon glaze. I then proceeded to eat way too many biscuits, covered my face in hardened, sugary glaze, and could not eat my actual dinner because I was too full and sick from sugar. It was glorious. The best thing too – these are quick to make. About thirty minutes of prep and cook and you’re ready to blow some people’s minds. Especially your own. Preheat oven to 450 degrees Fahrenheit. 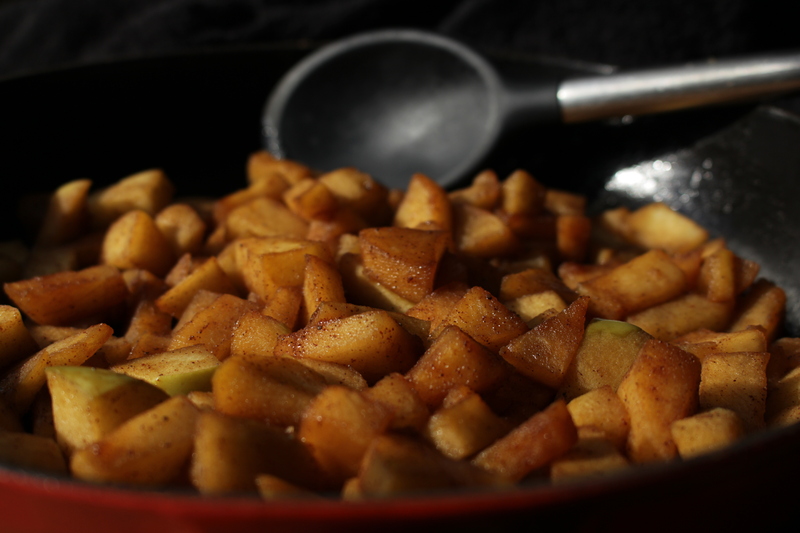 In a skillet on medium heat, melt 1 tbsp of butter and put your diced apples, sugar, spices, and lemon juice in. Let it all cook together until the apples have softened and the liquid that it has released has reduced to half the original volume and thickened slightly. Transfer to a bowl and put in freezer while you work on your biscuits. In a small bowl, add your lemon juice to the almond milk to make “buttermilk”. Set aside. In a large mixing bowl, whisk together dry ingredients. Add the cubed butter and use your fingers or a pastry cutter to combine the dry ingredients and the butter until the mixture looks like coarse crumbs. Work fast so that the ingredients don’t get too warm. Pour in the “buttermilk” at 1/4 cup at a time into the dry ingredients and mix gently with a mixing spoon. You might not need all of the “buttermilk.” Mix until just combined – the dough will be sticky. Turn the dough out onto a lightly floured surface. With a lightly floured rolling pin – gently roll the dough out into a 1/2 inch thick disk. 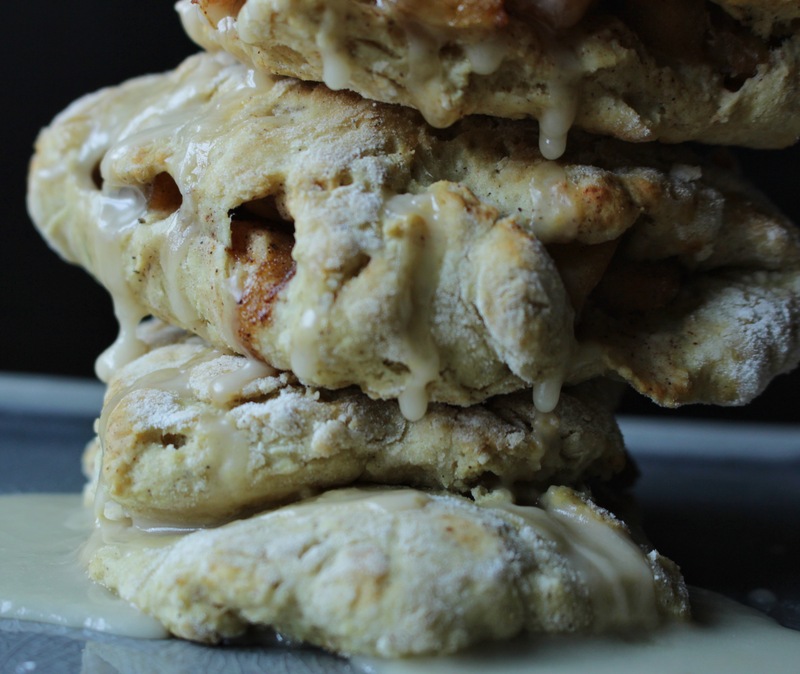 Take the apple pie filling from the freezer and pour it onto one side of the biscuit dough. 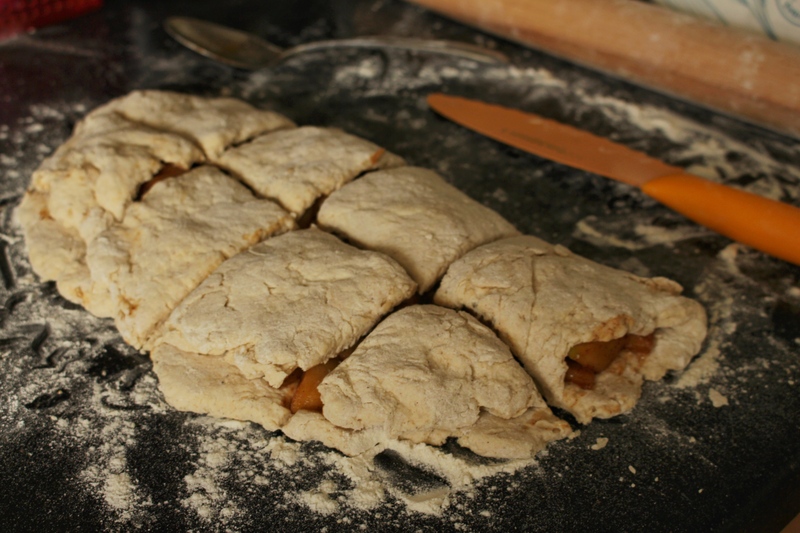 Fold the other side of the biscuit dough onto the apple pie-filled side. Cut into 7 – 8 squares. Transfer the biscuits onto a greased cookie sheet (or non-stick). When transferring biscuits, lightly pinch the sides of the biscuits to keep the apple filling in. It doesn’t have to be perfect or thorough. Bake for 12-15 minutes. While the biscuits are baking – make your glaze by whisking the syrup, the bourbon, and the almond milk into the powdered sugar. The consistency should be thick enough to coat a spoon. Once the biscuits are done baking, let them cool for 5 minutes and then glaze. Serve immediately. Enjoy the hell out of these, guys. I know I did. These enticing pictures were captured by the talented Nick W.